Fall rehearsals for the 2018-2019 season begin Thursday, September 6, 2018. Rehearsals generally take place Thursdays from 7:30 to 9:30 p.m. at South Salem Presbyterian Church in South Salem, New York. Camerata d’Amici performs three concerts per season in addition to outreach concerts in neighboring communities. Our concerts for the 2018-2019 season are scheduled for December 9, 2018, March 3, 2019, and May 19, 2019. Now in its thirteenth season under the direction of Kristin Sponheim, Camerata d’Amici is a 35-member auditioned choral ensemble, drawn from towns in Fairfield and Westchester counties. 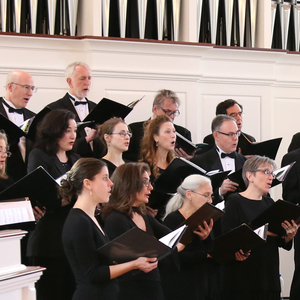 Camerata sings a repertoire that spans the centuries, from Renaissance motets to Romantic partsongs to new works from the twenty-first century. We are a collegial, mutually supportive group of dedicated singers, united by a desire to capture and express the unique capability of music to touch the hearts of our audience. For more information, visit cameratadamici.org.